In deep fryer or 2-quart heavy saucepan, heat oil over medium heat to 350°F. Separate dough into 8 biscuits. 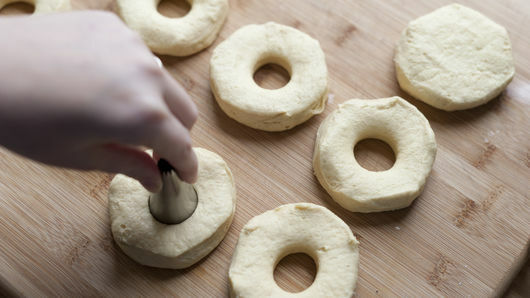 Using small round cookie cutter, cut hole in center of each biscuit. Gently place 2 or 3 biscuits in hot oil. (Biscuit holes can also be fried!) Fry on one side until golden brown. Gently turn with tongs; fry until other side is golden brown. Place on cooling rack; cool 3 to 5 minutes. Meanwhile, in small bowl, mix powdered sugar, milk and vanilla until thick glaze forms. Remove half of the glaze to another bowl. Add 1 dot red food color paste to 1 bowl of glaze; stir until incorporated. Add more food color, if necessary, until desired pink shade is reached. Tint second bowl of glaze to desired shade with yellow food color. Dip 4 doughnuts in pink glaze and 4 in yellow glaze. Return to cooling rack. Immediately top with sprinkles. Let glaze dry 2 to 3 minutes before serving. 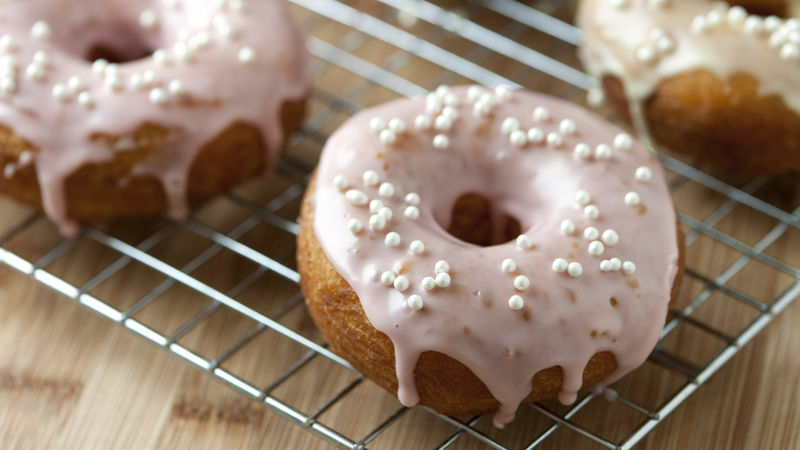 Flavor the pink glaze with raspberry extract and the yellow glaze with lemon extract, if desired. 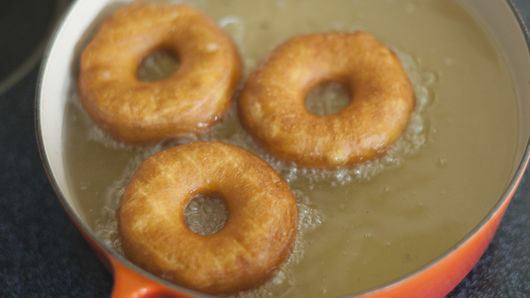 Doughnuts can also be coated with cinnamon-sugar instead of glazed. Just give them a shake in a paper bag filled with a mixture of granulated sugar and ground cinnamon.